I am doing these gingerbread houses now for 15 years for my family, friends and colleagues. It's a typical winter - or Christmas decoration in our country. Hope you like it. 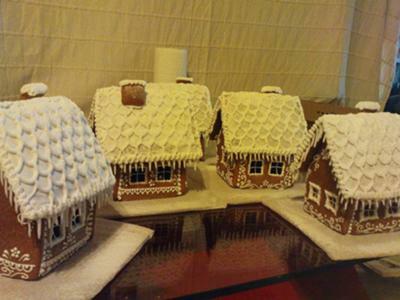 Best Gingerbread I have seen ......keep up the beautiful delicate adorable houses. The detail is intricate and perfect. Charming is best I can describe ! MY FAVORITE BY FAR!! I love your design. Keeping the house simple makes it so lovely. I am just starting out and these inspire me. Great job. Very nice decorations along side the house at the bottom, they are so delecate and small. Very nice work, never seem to get that right. But hey 15years of experience, well done. Your houses are just so delicte and beautiful! I love your roofs! Your frinds and colleauges are very lucky to receive these!Wow! Your houses are beautiful! It is a lovely traditon to give such a dear gift, I think I will have to make more time for building these little treasures next Christmas.